Join Us at "The Play-By-Play on Fatherhood"
On this Friday, unlike any other time in history, the wide world of sports and the world of fathers comes together! 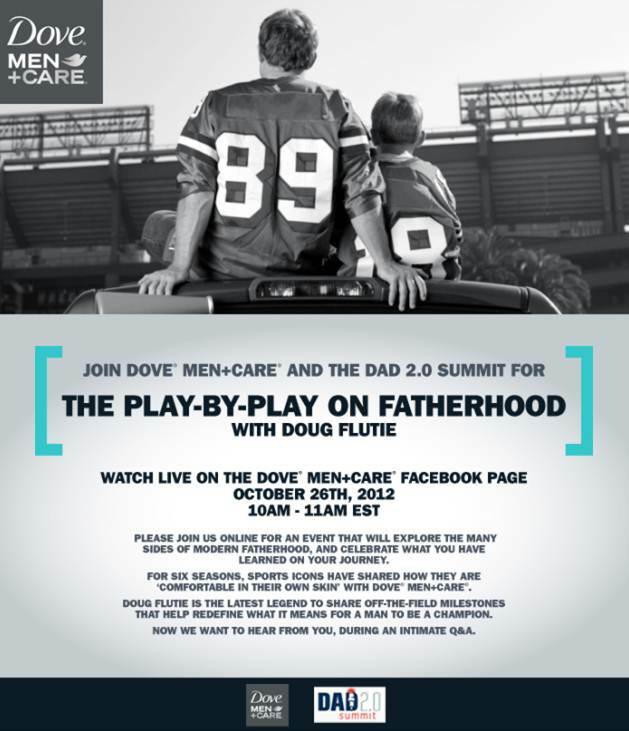 Dove®Men+Care® and Dad 2.0 Summit are partnering for "The Play-By-Play on Fatherhood with Doug Flutie" and we couldn't be more excited to be a part of an event that will advance the public dialogue on responsible fatherhood. "For football fans, you know Doug Flutie from the Hail Mary pass that beat Miami on national TV in 1984. You know about his subsequent 20-year career in the NFL, CFL, and USFL, despite the prevailing wisdom that he was too short to make it as a pro quarterback. You know about Flutie Flakes. What you may not know, however, is that Doug’s son was diagnosed with autism at 3 years old, and since 2000 the Doug Flutie Jr. Foundation has raised more than $13 million to help improve the quality of life for people and families affected by autism. Doug is also part of Dove®Men+Care®’s latest “Journey to Comfort” campaign, which touches on fatherhood as never before. He’s amassed a lot of specific insights about how fatherhood changed his life, as it changes every man’s. And on October 26, he’s going to sit down with us and talk about them." National Fatherhood Initiative has been invited to “The Play-By-Play on Fatherhood,” along with several dads who will explore, promote and champion fatherhood. Join National Fatherhood Initiative and many other dads for the live-streamed broadcast on the Dove®Men+Care®Facebook page on Friday, October 26, at 10am Eastern. During the live-stream connect with the host and attendees by commenting on Facebook and tweeting to @DoveMenCare, @dad2summit and of course @TheFatherFactor!